Doctors, nurses and other healthcare professionals have important roles to play in guiding and supporting the cancer patients through all stages of their cancer journey (NHS, National Cancer Plan 2000). Alongside acquiring a sophisticated understanding and technical skills to plan and deliver current cancer treatments, it is also required that the healthcare professional (HCP) listens and responds. It is well known that cancer causes a range of difficult and complex emotional reactions such as; anxiety, depression, anger, uncertainty and fear (Scott 2002). Imparting information to the cancer patient is as important as it is difficult. 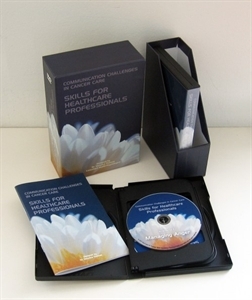 The Skills for Healthcare Professionals DVD box consists of 10 DVD's and a booklet. Although each scenario tells its own story, the DVD's are not necessarily designed to be viewed from start to finish without any breaks. Rather, they can be stopped at any point at which the presenter or the learners wish to make comments. Each scenario is time-coded and the notes in the handbook provide the presenter with a brief outline of teaching points, which can be raised.